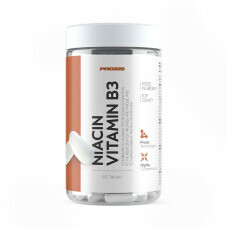 Niacin, also known as vitamin B3, nicotinic acid or nicotinamide, is an important enzymatic component for the normal functioning of the body. This vitamin enables obtaining energy from macronutrients ( carbohydrates and fat). It is a very important micronutrient for energy synthesis, a healthy nervous system and digestive system. It also contributes to the vitality and health of skin, hair and eyes.